The eastern brook trout (Salvelinus fontinalis) — the official freshwater fish of Virginia — is valued by conservationists and sportsmen alike for its beauty and as an indicator of high water quality. 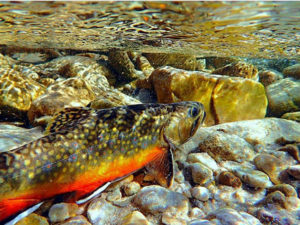 Once widespread, the native brook trout has been lost from 38% of its historic range and are now found primarily in headwater streams in and around Shenandoah National Park and the George Washington and Jefferson National Forests. Brook trout need clean, cold water (no higher than 68º F) to survive, and land use changes and habitat degradation over the course of the past century have significantly decreased their populations. Restoring riparian buffers and replacing failing road crossings on private and public property is a priority for the conservation of this species. It is also a way to increase climate and infrastructure resiliency, improve water quality, and restore habitat for numerous other aquatic species. — effectively cutting off pockets of fish from larger populations and important spawning habitat. Poor fish passage creates isolated populations, causing low genetic diversity and the inability to move to healthier habitat. 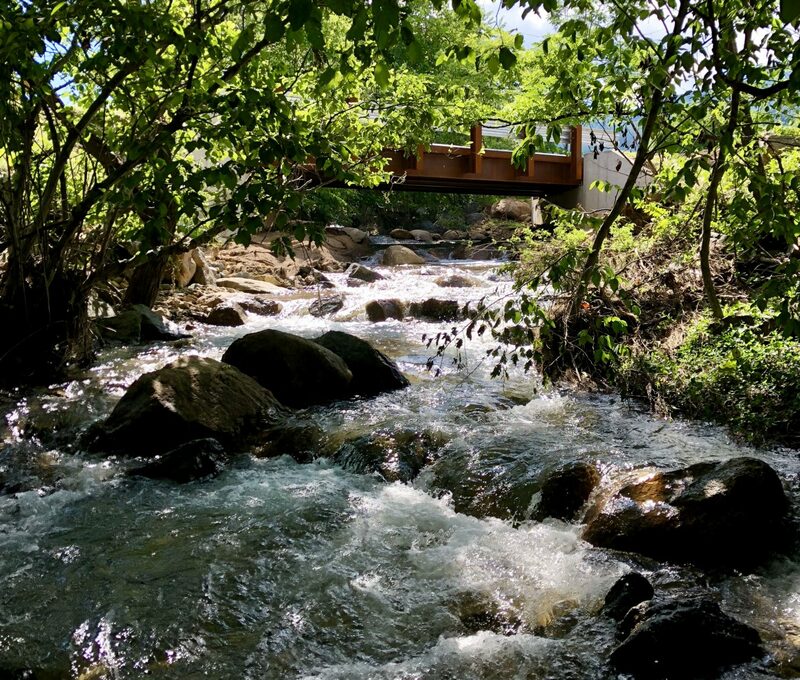 Lack of riparian buffers further downstream increases water temperatures, polluted runoff, and restricts access to food, creating unsuitable habitat for many aquatic species and impacting water quality. In 2013, the Piedmont Environmental Council (PEC) surveyed barriers to aquatic organism movement in all Class 1 trout streams (as designated by the Virginia Department of Game and Inland Fisheries) in Rappahannock, Madison, Greene, and Albemarle counties. PEC found that out of the 133 crossings assessed, only 41% had full aquatic organism passage. Perched culverts that sit higher than one foot above the water surface create significant barriers for aquatic organisms attempting to migrate upstream. Undersized crossings restrict natural stream flow, particularly during floods. They cause problems such as scouring and erosion, high flow velocity, clogging, and ponding. Improper crossings, coupled with inadequate vegetated buffers, negatively impact both fish and water quality. These passage and habitat issues also affect other species of anadromous fish and many sensitive species, such as American Shad, Atlantic River Herring, and imperiled freshwater mussels. Solutions discussed above could be replicated and would provide the same benefit for many aquatic species throughout the Commonwealth. The Virginia Department of Transportation (VDOT) manages the majority of road crossings in the Commonwealth. VDOT is regulated by Total Maximum Daily Load (TMDL) goals for pollution reduction, as issued by VDOT’s own Municipal Separate Stormwater Sewer System (MS4) permit. By working to replace failing crossings and restore stream buffers, efforts could be applied towards VDOT’s water quality goals as described in the Chesapeake Bay Agreement and MS4 permit. Additionally, by replacing failing crossings with more flood resilient designs, VDOT will benefit from substantial long-term cost savings of infrastructure maintenance. The Department of Game and Inland Fisheries (DGIF) monitors fish populations throughout the state. DGIF, Trout Unlimited, and other conservation groups rely on population data to make informed decisions on prioritizing stream restoration projects, which require a lot of resources. Many stream reaches in the brook trout’s range are not regularly monitored due to limited staffing and resources. DGIF should be appropriated more financial resources to assess this species populations more frequently. Revegetating riparian buffers and replacing failing road crossings is paramount for the conservation of eastern brook trout — our state fish — and other at-risk aquatic species. Improving habitat for aquatic organisms will also give VDOT the opportunity to improve infrastructure resiliency in the face of climate change while simultaneously allowing the agency to meet its MS4 goals. Recommend that the Department of Game and Inland Fisheries (DGIF) enter into a Memorandum of Understanding (MOU) with the Virginia Department of Transportation (VDOT) and Department of Conservation and Recreation (DCR) designed to require the consideration of fish-friendly stream crossing design alternatives whenever new stream crossings are proposed or existing crossings are being replaced throughout the Commonwealth. This MOU will insight the alternatives consideration when these activities occur in DGIF-mapped trout habitat or would impede the movement of migratory fish species. Currently, there is a similar existing MOU between VDOT, DCR, and DGIF that requires the annual consideration of public water access at road crossings where work or maintenance is proposed. Including the consideration of fish-friendly stream crossing design alternatives provides another important avenue for interagency collaboration on projects that benefit fish and wildlife and are consistent with the Chesapeake Bay Agreement goals. Support legislation or administrative action that would direct the Virginia General Assembly to appropriate $250,000 from the general fund to the DGIF budget for Wildlife and Freshwater Fisheries Management (Item 372, Wildlife Management and Habitat Improvement 51106) to increase the frequency, specificity, and reliability of the fish shocking data collection efforts.